Are looking for a career that offers the opportunity to provide a needed service to others? Our dental assistant program offers a solid and intense program to ensure that our students acquire the confidence and skills needed to perform the very first day on the job. Our dental assistant classes utilize state-of-the-art equipment combined with a complete dental operatory to provide a virtual dental office designed to groom students for the actual work environment. There is constant one-on-one interaction to learn about the equipment and the latest techniques used in today’s dental field. Our classrooms are spacious and efficient for practicing techniques. Be in demand as a Dental Assistant! A dental assistant is invaluable as a member of the dental health team, providing assistance to chair side, laboratory and administrative procedures. 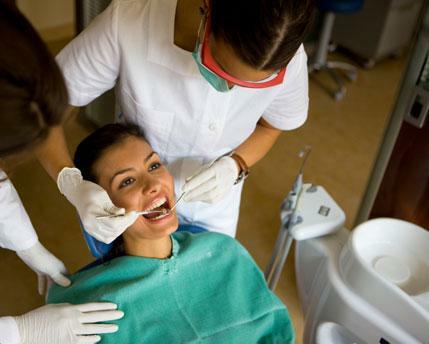 At chair side, they assist the dentist in making patients comfortable and preparing them for treatment. They hand instruments and materials to dentists and are responsible for sterilizing the instruments used. In the office, they schedule and confirm appointments. In the lab they make casts of teeth, clean and polish removable appliances and make temporary crowns. Dental assistants are always in demand. According to the Bureau of Labor Statistics, employment of dental assistants is expected to grow by 31 percent from 2010 to 2020, which is much faster than the average for all occupations combined. Ongoing research linking oral health and general health will continue to increase the demand for preventive dental services. As dental practices grow, more dental assistants will be needed. Our dental assistant classes utilize state-of-the-art equipment combined with a complete dental operatory to provide a virtual dental office designed to groom students for the actual work environment. There is constant one-on-one interaction with the equipment and latest techniques used in today’s dental field. Classrooms are spacious and designed to be efficient for advanced practicing of techniques. Additionally, having a calm and positive demeanor sets a good tone in the dentist’s office and helps patients feel less anxious, so your attitude is a huge part of a dental assistant job. You will have the opportunity to meet many patients and could be one of the first faces they see upon entering the office. The dental assistant program at Midwest Institute is institutionally accredited by ABHES. Graduates are eligible for — and encouraged to take — the National Entry Level Dental Assistant (NELDA) Certification Exam, which is offered by the Dental Assisting National Board (DANB), Inc. Passing the NELDA exam conveys qualification to perform duties in those states that recognize the exam or certification as meeting state dental assisting requirements. Graduates are also eligible for and encouraged to take the “Basic Skills” examination, which is offered by the state of Missouri and recognized on a local level. In addition, the American Medical Technologists (AMT) offers the Registered Dental Assistant (RDA) examination, which is also available to graduates of the Midwest Institute Dental Assisting Program. Both he NELDA and the RDA examinations are recognized on a national level. Dental assisting is more than a job — it’s a chance to develop a satisfying career that brings you joy each and every day. Getting a great dental assisting job in St. Louis, the state of Missouri, or another part of the country is just weeks away! Midwest Institute’s accredited dental assistant training program is offered at the Earth City campus and Fenton campus. If you have any questions, just contact us, and one of our knowledgeable admissions counselors will respond promptly to assist you. This program is offered at the Earth City and Fenton Campuses. See our Dental Assisting students in action!